As our business grows, there’s always a team or two trying to find new software. Whether it’s to replace a system we’ve outgrown or discover a new solution to streamline an ineffective process. But, the hunt isn’t always as easy as we’d like. Where do you begin, who’s involved, and how can you be confident in your search? After a few years, a few missteps, and a lot of trials, we’ve thankfully honed our search process to find the best software here at LearnUpon. As we worked on our own internal process it got us thinking. Every day we talk to organizations who are in the exact same situation. 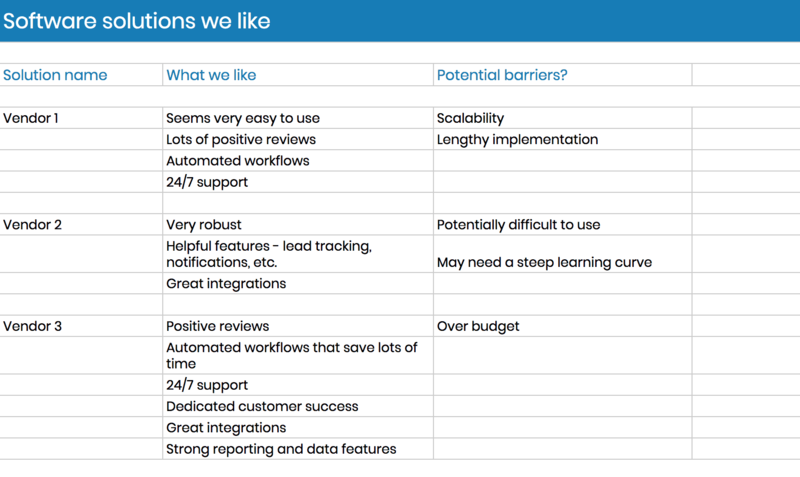 Teams trying to find business software (in their case an LMS) that optimizes their processes. So, to aid you in successfully finding the best software for your business, we’ve recorded our internal process and are sharing it today. It can be used for most, if not all, the software you need - LMSs, CRMs , support tools, and more. First and foremost, we've found that getting your stakeholders in order is a clever move. Your immediate team: They're the ones that will be using the software after all. You need to know they’ll be happy with the tool and that it performs the functions they need. Team managers: They need to know the tool will give them the results they want and that it helps boost their team's performance. Security team: Something to be taken very seriously - Does this software meet your security standards? Your security team should have input in case something doesn't sit right. Tech team: Are there any technical considerations? Do you need to integrate with other tools? Input on how simple or complicated the software will be to implement is essential. Your customers: Although your customers aren’t directly involved in the process, consider how it will impact them, especially if it's software they will be interacting with. Your customer success and support teams can be their voice so you always have them in mind when finding business software. 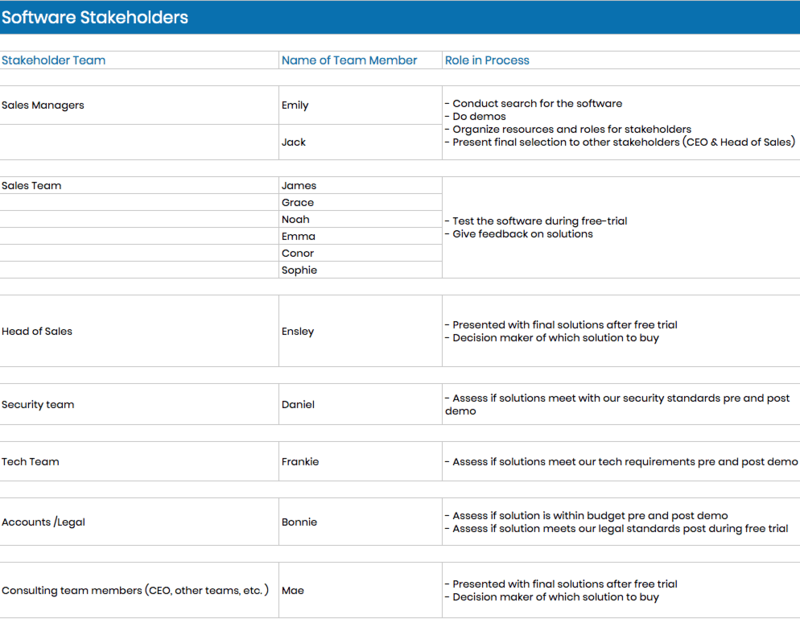 To make things as simple as possible for you and your stakeholders, keep a record of what team members are involved and when in the selection process you’ll need their input. Although a team member might not need to be involved until further down the line, it’s key that you know they need to be involved, their role, and that they’re aware of everything too. We've made this mistake in the past. Someone from our engineering or tech team wasn't informed of our search. Then, when we needed them to come on board, they were out of the loop or had limited time to contribute. It brings the whole process to a screeching halt. So, make your list, let them know they will be involved, and what's needed from them. It's the best course of action for a quick turnaround. 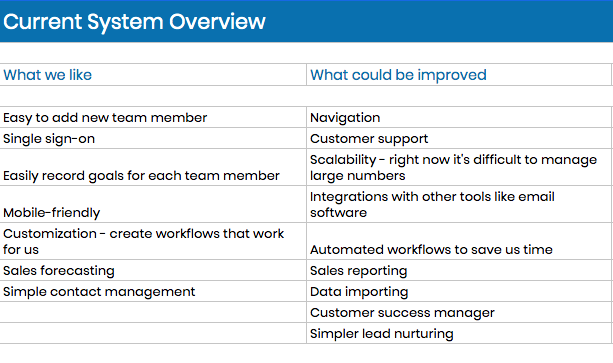 Now, it's on to figuring out what you want from your new solution - features, functionality, workflow, etc. At this point there’s a divide - experienced vs. first-time buyers. For each buyer type, the process is a little different. As an experienced buyer, there’s familiarity with the software you want. You've used it before or you already have a solution that's in need of an upgrade or replacement. As a first-timer, you can do something similar, just write down what you'd like to achieve with the new system. For example, if your team is manually doing something that takes up time, you’d want software that automates the process. Note: Already having the software when searching is beneficial. You know what to expect, and have a general idea of what you want to improve. But, you may have biases and get stuck on an idea of what this software should be. To alleviate this, it’s worth running your evaluation past a fresh pair of eyes who can critique it to ensure you’re focused on need-to-have functionality. With your evaluation done, you’ll have a substantial list of what you want. This list will be the driving force of your search. You’ll know what you actually need from a system and have an easier time with your search. 3. Where to find business software? The actual search for a vendor differs for each piece of software. Some have well-known vendors that pop into your mind immediately. Others need a deeper dig and are discovered through different sources. Google: Obvious we know, but it’s the best place to start. We simply type in best *insert chosen software* and see what resources are thrown back at us. Software comparison sites: There are quite a few out there - G2 Crowd, Capterra, Software Advice, and more - listing different solutions. They’re perfect for giving you a quick overview of a solution's features, functionality, etc., so you see from a top level if it works for you. Even better, they have reviews from users so you learn what real companies really think of the software. Tip: Don’t immediately discount a vendor based on these sites. They don’t always have every single piece of information you need. If a vendor ticks most of the boxes, visit their website to get a more in-depth picture. Other companies: A quick way to discover software tools is to look at what others in your industry are using. Scan who your competitors use, ask others in your industry for advice, reach out on LinkedIn and ask your network. You'll get lots of information about solutions that fit your use case. Content resources: If you can get your hands on buyer’s guides, different business’s handbooks and more, for a particular software, read them. You'll get tips of the trade and they'll show you where to aim your search. When a solution stands out, make a record of it. Detail the features it has, what looked interesting to you, and differentiators. That way you’ll easily be able to keep track of the platforms that interest you. Remember though, during your search, your feature and wants list that you’ve created is a great resource, but it’s not the be all and end all. At this stage, don’t discount a tool because it doesn’t have one feature that would be nice to have. Also, don’t get seduced by a “cool" new feature. This can result in you abandoning your original goal and sacrificing something you take for granted, like ease of use or time-saving workflows. Your list is an invaluable guide, but be mindful that nothing’s written in stone! Vendor list in hand, it’s time to start contacting the ones you’re interested in. Usually, we have a pretty long list of companies to contact (10-15), but it’s worth reaching out to as many as you can. If the vendor offers a demo, take it. We see so many people avoiding demos. They just want to dive into a product themselves. Yet, we know from our experience at LearnUpon you get the most value from a product when you’ve seen someone who knows it inside out explain what it can do for you. During and post demo, ask lots of questions. This is your chance to get information from the horse's mouth, use it. Also, if you can, get documents - a company overview, feature overviews, eBooks, whatever you can get your hands on to make a more educated choice. After the demo, there should be 3-5 vendors who stand out as your favorites. These are the ones to trial. If you have more than 5 on your list, be brutal. You can’t do a free-trial for all of them. Pace your free-trials: Don’t test every piece of software at once. It gets confusing and you may end up not having enough time to test every solution as much as you’d like. One-to-two trials at a time is more than enough. You and your team will be able to really dig in to the system and give it a thorough evaluation. Pre-plan test workflows: If there are specific workflows you want the solution to do, make a note of them and test them out. It’s critical the system does what you need it to. Prepare your team for the trial: Tell every team member involved what you want to achieve from the test process and how you would like it achieved. Give them tasks to accomplish and encourage them to give honest feedback on their experience. Have a feedback loop in place: We always have a document where every team member provides their thoughts throughout the trials. Whether it’s rating workflows and features from 1 to 5 or sharing written notes, structure and order here is a must. Ask questions, test the support team: Raise tickets, ask questions, time and review answers for helpfulness - this is the only way to discover how on the ball each vendor’s customer support really is. All of these steps together should give you a well-rounded, accurate view of what each system is really like. Fingers crossed at this point you have your top pick and it’s up to you to make a case for it to your final stakeholders. Depending on the team and software, we present our findings to the head of the team, our CEO, and any other team members involved. Pros, cons, features, price, support team response - include it all and make your case for the solution you believe is right for you. After these steps you should end up with software that fits your business’s needs. Good luck!